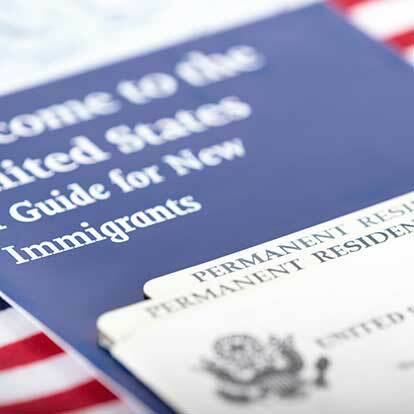 Employers and employees who want to obtain an immigration visa for permanent residence in the U.S. can apply for an immigrant visa, commonly known as a Green Card. We can help you determine if you have the right skills, education, and work experience to apply to live permanently in the United States, and help you get all the necessary approvals to obtain your Green Card. EB visas are for those who are seeking to come to work and live in the United States permanently. Each type of EB visa requires different documentation and is geared to a different type of immigrant. The spouse and children under the age of 21 of an EB visa holder may also obtain permanent residency status. This visa is for those with extraordinary ability in the sciences, arts, education, business, or athletics; outstanding professors or researchers; and multinational executives and managers. This visa is for professionals, skilled workers, and other workers. Typically a baccalaureate degree or at least two years of experience is required in a specific field in which qualified U.S. workers are not available. Labor Certification and a permanent job offer are required. This preference is for “special immigrants,” which includes certain religious workers, employees of U.S. foreign service posts, broadcasters, former U.S. Government employees, Iraqi/Afghan translators, Iraqis/Afghanis who otherwise assisted the U.S. Government, foreign medical graduates, retired employees of international organizations, armed forces veterans or enlisted, alien minors who are wards of courts in the United States, and other classes of aliens.